15 Reasons Why Pizza Is Actually Really F*cking Good For You! * 15 Reasons Why Pizza Is Actually Really F*cking Good For You! In life- somethings bear repeating! With that in mind, give a look at- “15 Reasons Why Pizza Is Actually Really F*cking Good For You!- which first appeared on Jeff Eats back-on April 20, 2016. The reason for this morning’s republication… last night’s 3 delicious- gooey cheese, sweet sauce, thin/crispy pepperoni slices from Stella’s Pizzeria, 19585-M South State Road 7, Boca Raton, Florida 33498, (561) 487-1886, stellasbestpizza.com, Reviewed 1/1/17. Last night Jeff Eats and Mrs. Jeff Eats did “takeout” from Bambini’s Garden Pizzeria, 14466 Military Trail, Delray Beach, Florida 33484, 561) 638-6442 (stories- 3/3/15 & 8/30/15). Simple order, chicken parm sub, sausage & peppers sub, large cheese pizza. Everything was delicious. If you live or work by Bambini’s and haven’t yet tried it- try it, you’ll love the food and the prices are right on the money! Anyway, this morning at 6:30am for breakfast- Jeff Eats “did” 2-cold right out of the refrigerator Bambini’s slices and 2-8oz cans of ice cold Orange Sunkist and I got to thinking as to whether or not Jeff Eats eats too much pizza! Long story short, I stumbled upon-15 Reason Why Pizza Is Actually Really F*cking Good For You!- on elitedaily.com and thought I’d share its “take” on eating pizza with you guys! As you will soon read, Pizza Is Actually Really F*cking Good For You!- so if you’re like Jeff Eats, eat away! One last piece of business, Jeff Eats couldn’t find any internet “pro or con” articles about drinking 16oz of ice cold Orange Sunkist at 6:30am- so I’m gonna assume that doing-so is like eating cold pizza in the morning- that being A-OK for numerous and sundry reasons (which for the time being, Jeff Eats hasn’t yet found on the internet)! When it comes to the world of culinary achievements, pizza takes the cake or, in this case, the pie, every time. Pizza is probably one of the only foods that holds a special place in pretty much everyone’s hungry hearts. But then again, what’s) not to love about these divinely delicious triangles? Pizza is the epitome of a perfect snack. It combines a crispy crust that’s drenched in savory sauce and concealed underneath a mountain of melty, gooey mozzarella cheese. And that’s not even considering the endless array of toppings you can layer on to craft the ultimate heaven-sent snack. Deliciousness aside, pizza is also relatively healthy, not to mention one of the most convenient meals on the face of the planet. It’s quick, inexpensive and available at the wee hours of the night. Plus, you can even get someone to bring it right to your doorstep so you don’t have to interrupt your six-hour Netflix marathon or actually have to put on pants and venture out into public when hunger calls. It really doesn’t get much better than that. If people tell you they don’t like pizza, you should probably consider cutting them out of your friend circle. Seriously. You don’t need that kind of negativity in your life. If you weren’t already on a strict dollar slice regimen, here are a few more reasons you should consider adding a couple slices to your life. It might seem hard to believe, incorporating a few slices into your diet on the reg can actually protect you from certain types of cancers. 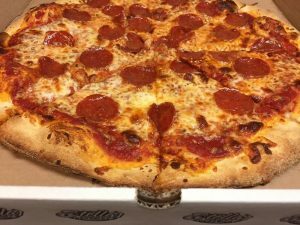 Studies have found that bi-weekly pizza eaters were 59 percent less likely to develop cancer of the esophagus, 34 percent less likely to develop throat cancer and cut their chances of getting colon cancer by 26 percent. Pizza is pretty much the holy grail of heavenly foods that will satisfy your drunchies after a long night of drinking. All that dough will help soak up some alcohol. Plus, it’s quick, cheap and portable so you can grab a slice and eat it on your way home after the bar. It’s no secret that tomatoes contain lots of lycopene, an antioxidant compound that helps prevent heart disease and illnesses. But eating lycopene-packed foods that also have small amounts of fat, like pizza, will make your body absorb this antioxidant much better. So, bring on the extra cheese. Pizza has seen you at your absolute worst and never throws any shade. Whether it has witnessed you drunkenly demolish five slices after coming home from the bar or soaked up your tears as you binge ate your way through a breakup, this delicious snack has always had your back. Let’s face it, when it comes to fast food, chowing down on a slice of pizza will make you feel a lot less guilty than demolishing a Big Mac and fries. Not only is pizza downright delicious, but it’s affordable. If you live in New York City, you know that no matter where you are, you’re never too far from a place that dishes out dollar slices. Whether you prefer your slices plain, piled high with pepperoni or decked out in boatload of buffalo chicken and bacon-ranch, the possibilities are pretty much endless when it comes to dressing up your pie in something that suits your taste. Most places even have special pies that are gluten-free. While most foods hit the sack around midnight, pizza doesn’t mind staying up late. Whether you find yourself seriously hangry while pulling an all-nighter in the library or on a quest for food as you stumble home from the bars, pizza is always there to solve the struggles of needing a scrumptious late-night snack. Plus, pizza always looks breathtakingly beautiful, despite the fact that it skips out on its beauty rest. 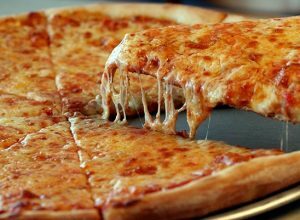 Thanks to all of that melty, mouth-watering cheese, a single slice of pizza contains about 15 grams of protein, which not only gives you energy, but also helps your body repair cells and build big strong muscles. So if you’re hitting the gym hard, a few slices make the perfect cheat meal. Pizza is probably the best thing that ever happened to lazy people. You don’t even have to leave your home to get your hands on one big, badass pie. Thanks to all those dedicated delivery boys, all you have to do is call up or go online and, within no time, there’s a piping hot delicious pizza waiting at your door. You can get creative with your ingredients and tailor your pie to fit any meal in a way that goes way beyond cold pizza for breakfast. Just throw a few fried eggs on your pie and you’ve got a tasty pizza to start off your morning. Looking for something sweet? Slather that dough in Nutella and you’ve got a delicious dessert pizza at your fingertips. Simple. Loading up your pie with some veggies, is a great way to up your intake of essential vitamins. Plus, if you’re not really into eating your greens, pizza pretty much acts as a delicious disguises for those unsightly vegetables and let’s face it, broccoli looks a lot more appealing when it’s blanketed in the trio of melty cheese, sauce and crust. While there may be an age-old debate over thin crust and deep dish, researchers found that Chicago style pizzas have more illness fighting antioxidants because of their crust size, longer baking time and higher oven temps. So go ahead and demolish those deep dish slices. Pizza is one of those few foods that can be adapted to fit any occasion. If you’re feeling fancy, you can opt for the foodie-approved side of the pizza spectrum by dressing it up in some delicious artisan toppings and serving it in a trendy restaurant. Or if you’re looking to take the more ratchet route, you can just grab a dollar slice and grab a seat on the sidewalk curb. Either way, it’s always effing delicious. From pizza Fridays in your elementary school cafeteria to late-night get-togethers during your college days, pizza has always been there for you whenever you needed a delicious friend. Plus, it’s loyalty is unmatched. You can be sure pizza will never spread rumors about you, steal your boyfriend or tag you in hideous pictures on Facebook. As the saying goes, people disappoint, but pizza is eternal. Ive been eating Stella’s Pizza for over 20 years. It’s absolutely delicious. Nino’s and Stella’s are the 2 best mom & pop pizza joints in Boca Raton, hands down! Ive been a customer of both for over 25 years and in all those years, neither joint has ever missed in the food department. Stella’s is a real hole in the wall, maybe we’re talking 6 tables! Formerly known as Perrini’s Pizzeria & Ristorante- Stella’s (same owners) has been pumping out top-shelf pizzas, real good subs and “other” delicious red sauce Italian stuff for over 30 years. Trust Jeff Eats on this one- Stella’s Pizzeria is a winner! ***** Perrini’s Pizzeria & Ristorante, 19585-M State Road 7, Boca Raton, Florida 33498 (561) 488-4371. Tonight, I sampled Perrini’s veal parmigiana, chicken marsala, shrimp scampi and pizza…and I have to tell you, that the pizza was absolutely terrific…actually it was one of the best slices that I have had down here in South Florida. The other stuff was very good, but the pizza is in a league of its own. Like I said before, Perrini’s is a hole-in-the-wall…From any seat in the house, you can see the pizza ovens, kitchen and the entire “take-out department.” This is strictly a “mom & pop” affair, so don’t expect anything special decor-wise. You know the drill here, soup or salad/entree/side of pasta/garlic rolls…the veal parmigiana and chicken marsala go for $15.49…the shrimp scampi is a buck more at $16.49…a large pizza goes for $13.49. Perrini’s menu also has daily “specials” like a large pizza and one dozen chicken wings for $17.99. I am telling you, that the pizza alone makes Perrini’s a home-run joint in my mind. If you live in the Boca Raton area, Perrini’s is a real good place to know about. Perrini’s is open Sunday-Thursday 11am-11pm and Friday-Saturday 11am-midnight. I always suspected that pizza was good for me. Its meatballs and chicken parm are also 2 of my favorite dishes. I also really like Bambini’s Pizza. Both make really delicious pizzas.